Tam, who designed the PMQ’s original concept and now works as a consultant to the government’s Architectural Services Department, which renovated the complex, will occupy one of the PMQ’s units, where he plans to host regular exhibitions showcasing his architectural works. Though some tenants are more service-oriented, like Tam, others designers will use the PMQ as a platform to develop their own brands and retail businesses. That is the case for C’monde, a design studio run by Johan Persson, an industrial designer and design consultant who moved to Hong Kong from Stockholm eight years ago, in order to be closer to mainland factories. “I’m going to use the space for pop-up stores,” says Persson, whose portfolio includes headphones for Swedish clothing brand WeSC and Butchers Deluxe, a 2010 project that invited Hong Kong artists and designers to create their own versions of the iconic red lamps that hang in every wet market. He says is especially happy about the PMQ’s entrepreneurial focus, which he thinks is the best chance for young Hong Kong designers to become successful, since the hierarchical nature of most local companies stifles innovation. “The people there are taking the same chance as me – those are the people that I’d like to be surrounded by,” he says. Persson also hopes that the PMQ will foster collaboration between designers, especially local and expat designers, who sometimes seem to operate in different universes. For that reason, he says he is thinking of reviving Butchers Deluxe once he moves to the PMQ. “Things are pretty fragmented right now, so I hope that this can allow people in the creative community to learn from each other,” he says. Collaboration will be the focus of local lifestyle brand G.O.D.’s space in the PMQ, which will be occupied by a restaurant — the brand’s first foray into the food business. Recently, G.O.D. has begun working with outside designers to produce new products, such as a recent fashion collection developed with Chai Wan-based practice Tangram. “We’d like to take this collaborative process and really launch it at PMQ,” says G.O.D. founder Douglas Young. For Gene Miao, founder of the architecture and interior design firm 1:1 Limited, PMQ will offer a space to showcase his two latest projects: leather bags and a collection of furniture made with salvaged and surplus construction materials. 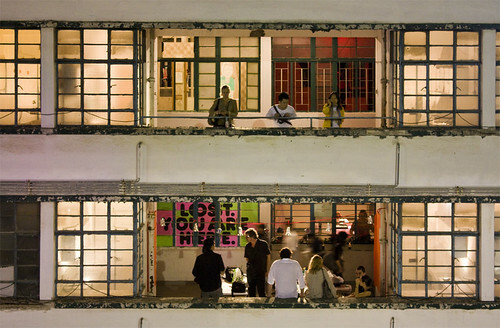 He plans to keep his current space in Kowloon Bay as a “production studio” while using his new PMQ studio to reach out to the public. “There’s so much foot traffic, which you would never get in Kowloon Bay,” he says. William To says the PMQ will be building its community “one step at a time.” A series of events will take place over the next several months to introduce the complex to the public, including a night market run by the organisers of Island East Markets, which will launch on April 18. “We’re already feeling a really positive energy,” says To. While the PMQ’s success as a design hub depends largely on its management, its success as a public space hinges on its architecture. “We want to draw unintentional visitors, people who say, ‘Hey, what’s that?’ and come inside,” says Billy Tam. Built on a steep hillside between Hollywood Road and Staunton Street, bookended by Aberdeen Street and Shing Wong Street, the PMQ consists of two terraced sites. One contains two residential blocks with a courtyard in between, while the second, lower terrace contains an open area and a two-storey building that once served as a clubhouse for police officers. The solution was to build a glass cube in between the two residential blocks — named the Cube, appropriately enough — that will contain a multi-purpose space for events and exhibitions, while also sheltering part of the courtyard from the sun and rain. It also provided a solution to the problem of noise; concerts held at the PMQ before its renovation were plagued by noise complaints from nearby residents. The renovation is also an opportunity to breathe new life into the surrounding neighbourhood. When the PMQ was still occupied by police officers and their families, a row of outdoor dai pai dong restaurants lined the Staunton Street side of the complex; the PMQ’s abandonment created a black hole that sucked away the vitality of the adjacent blocks. Tam says the PMQ will redress that by opening a series of shops, restaurants and cafés along Staunton Street; there will also be entrances to the complex on Aberdeen and Shing Wong, which should make the site even more permeable than when it was a police dormitory with only one entrance. This entry was written by Christopher DeWolf , posted on Monday April 14 2014at 01:04 am , filed under Architecture, Art and Design, Asia Pacific, Heritage and Preservation, Interior Space, Public Space and tagged Design, Heritage Policy, Hong Kong, PMQ, Renovation, Restoration, Urban Design . Bookmark the permalink . Post a comment below or leave a trackback: Trackback URL.